The Seamstress' Lair could be unveiled at this year's PAX. 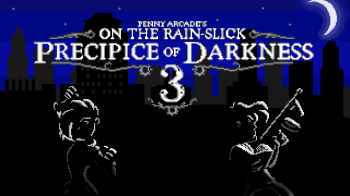 Penny Arcade's Jerry "Tycho" Holkins has revealed an expansion for On the Rain-Slick Precipice of Darkness 3. The DLC, entitled The Lair of the Seamstress, will be made available for free download. Holkins made no mention of an actual release date, saying that the Penny Arcade team is "hoping [it] will come out soon." He did, however, make a heavy-handed suggestion that it will coincide with this year's PAX conference, saying "Apparently there's some kind of big convention or something next month; maybe we'll try and put it out then." Holkins also announced that the game's developer, Zeboyd Games, will be starting work on the series' fourth and final installment very soon. According to the game's website, Precipice 4 will be released some time in 2013. That's not all, either, as Holkins stated that a further extension to Precipice 3 is in the works. The last DLC, which remains untitled, will apparently reveal the fate of the garden-tool-wielding protagonist from the first two games. Cryptically, Holkins added, "I'm one of those lore weirdos, you know? I always, always, always had a plan," possibly alluding to the character's absence from both the written and game versions of the third Precipice story. Penny Arcade's On the Rain-Slick Precipice of Darkness 3 is available for download now through Steam and the Xbox Live Indie Games service, and will be coming soon to Mac, iOS and Android.